The first stage of the Senegalese Ligue 1 2011-2012 finished on 20.05.2012. Four teams have advanced to the next stage: the Diambars academy and last season’s champions US Ouakam from “Poule A” and ASC Niary Tally and Casa Sport from “Poule B”. ASC Diaraf, historically the main club in Senegal, missed out on qualification by the slightest of margins and will be disappointed with their performance this season. Goalkeeper Mohamed Salzman, signed from CSS Richard-Toll before the season, played 13 of 14 matches and proved to be one of the revelations of the season. The defence of ASC Diaraf usually consisted of central defenders El Hadji Pape Seye Diallo and Jean Francois Diokh, left-back Babacar Seck and right-back Matar Kanté. 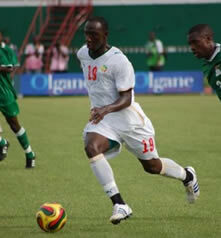 Diallo was signed from Guédiawaye FC before the season, while veteran Diokh won the league with US Ouakam last season. Kanté was part of the Yeggo Foot Pro team that won promotion to the Ligue 1 last season. Seck is an attacking-minded, modern full-back who could have a bright future in Senegalese football. Despite playing with four new defensive players, including goalkeeper Salzman, signed from four different clubs, the players blended rather quickly and ASC Diaraf conceded only eight goals in 14 matches. Gomis is also an interesting player, a tall (188 centimeters), strong defensive midfielder who fights hard and is important to the balance of the team. Badiane, formerly of SC Covilha (Portugal) and Maritzburg United FC (South Africa), and Diallo were both signed from AS Douanes before the current season. Up front, veteran striker Alpha Oumar Sow became the top scorer of the team. Sow was often partnered by Abdou Latif Guenoune or Ivorian striker Alpha Tidiane Koné. Koné, apparently a former player of Denguélé d’Odienné (Ivory Coast) and CS Hammam-Lif (Tunisia), will be disappointed not having scored a single goal in eight or nine performances. The Senegalese league is a physical league and both Sow and Guenoune are strikers with great strength. Sow has experience from European football, namely US Sénart-Moissy in France. Guenoune made a name for himself during the season 2010-2011, when he played for both ASC Dahra and AS Douanes. The picture is of Sow and was found on seneweb.com.